Flood your rooms with natural fragrance instead of chemical air fresheners by growing these easy-care fragrant house plants recommended by The Plant Lady, an interior landscape design company in Waterloo, Ontario. Citrus plant producing small, tart oranges. Blooms mainly in late winter and early spring. White flowers give a heavy perfume reminiscent of magnolias. Requires bright sunlight, moist soil and high humidity. Can tolerate temperature changes. Smaller species such as E. vernicosa, E. kybeanensis or E. gregsoniana are recommended for growing in pots as eucalyptus is prone to get leggy and overgrown. Provide bright light, and don’t let the pot dry out completely as wilted eucalyptus will not recover and the entire plant may die. As with most house plants, avoid over-watering as well. Dried branches of eucalyptus are available year round. The woodsy scent from dried eucalyptus will last for several months and is often used to shape wreaths. Arrange with other dried plants, or tuck pieces behind a picture frame. Hardy bulb available in flower from December to April. Clusters of porcelain-blue, pink, purple or white flowers give a potently sweet scent. To force your own hyacinth bulbs into flowering, plant in an aerated pot, covering with rich soil and store in a cool, dark spot until young plants grow to about three inches. Also see How to Force Spring Bulbs. In direct sunlight, your bulbs will flower in about two weeks. Once established, grow in a cool room, in bright but indirect sunlight, moist soil and average humidity. Narcissus are also available in flower from December to spring. Their fragrance is strong and musky. Force your own bulbs following directions given for hyacinths. Narcissus, however, enjoy high humidity – a bright windowsill above the kitchen sink is often a good place to grow these pretty flowers, which range in color from white to yellow. Annual plant that germinates from seed in 15 days. Sow seeds in early summer for winter blooms or buy the plant already in flower. Small bluish-purple flowers with prominent yellow stamens give a delicately sweet floral scent. Provide bright but indirect sunlight, moist soil, average to high humidity. This flowering plant like warmth and high humidity. Heliotrope has been valued for generations for its blue, pink, lavender or white blossoms with a fragrance reminiscent of lilacs. Can be grown from cuttings taken in the fall or spring. Place in partial shade, and water well when flowering. Prune right back after flowering. Used extensively in perfumes, jasmine thrives in partial shade, with constantly moist soil. Jasmine is nocturnal, and gives off its heady floral scent only during the night. 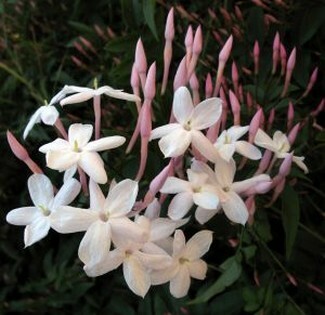 Jasmine species are often grown indoors for their lovely, fragrant flowers, but they are hardy in zones 8-10. Under ideal conditions, Jasmine will bloom continously for months. Likes bright light with some direct sunlight each day; east or west exposure. Keep soil moist as Jasmine wilts easily. White blossoms with a lily-like scent that open at night and give moonflower its name. Soak seed overnight before planting. Adult plants will need large pots and a cane or small trellis to climb on as they grow. Try covering an un-roasted coffee bean with moist peat moss and see if it sprouts! Germination, and established plants, both like warmth. Coffee plants produce lots of white flowers with a strong, sweet scent. A favorite of florists for its lacy leaves, the asparagus fern is easy to grow, even in indirect sunlight. The tiny white flowers of asparagus fern have a mild scent suggestive of apricots. Germinate seeds from the berries that follow flower production. Tolerates dry soil and a range of temperatures.